At South St. Louis Medical Associates, a St. Louis-based, internal medicine practice, we recognize that quality healthcare is a two-way street. The patient and physician are both responsible for the teamwork and communication to provide continual well being. That’s why we’ve created a practice that encourages proactive healthcare management — by putting patients first. 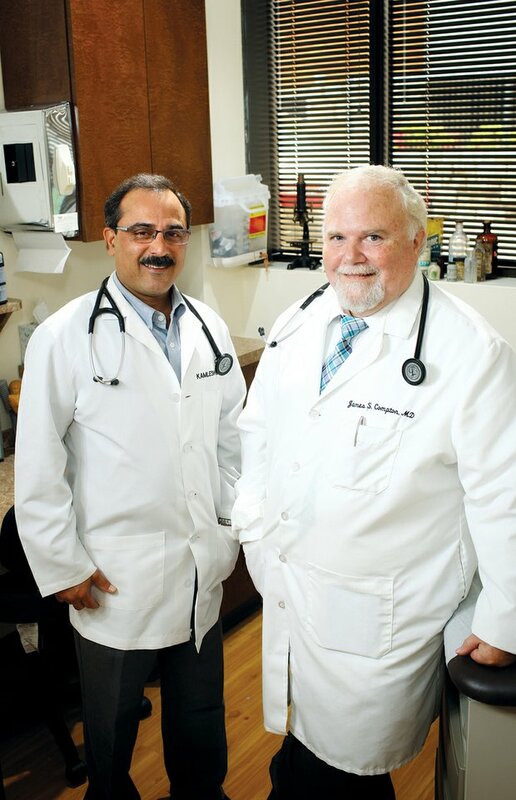 Our primary physicians include founder, Dr. James Compton and partner, Dr. Kamlesh Vyas. Dr. Jim Compton is known for his chair side manner, friendly demeanor, and ability to translate complex medical speak into plain English. Dr. Kamlesh Vyas partnered with Dr. Compton and joined South St. Louis Medical Associates at the beginning of the practice. Dr. Vyas’ well-rounded medical expertise and amiable personality allow for a cooperative, patient-centered practice. From our team of physicians and support staff to our in-house blood draws and medical specialists; from our on-site X-ray, Ultrasound, and CT capabilities to our prime location, South St. Louis Medical Associates invites you to experience our difference.